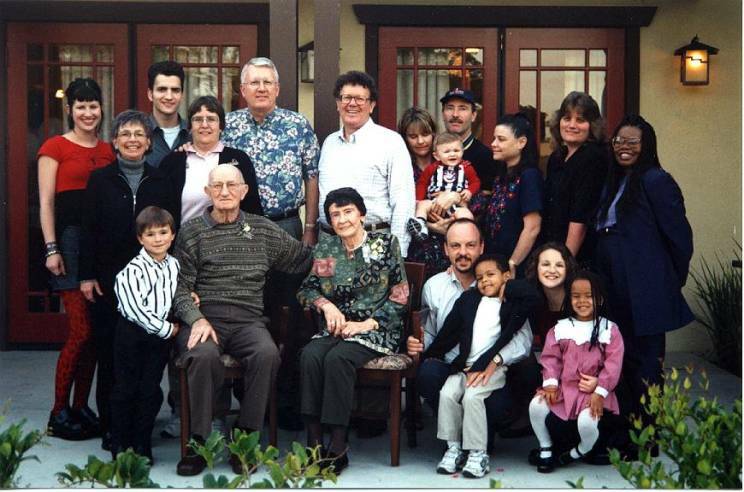 Four (4) generations of Ardis Folk gather at Irvine, California to celebrate the 65th wedding anniversary of Slim and Dorothy Ardis, in March of 2001. Both children, five (5) grandchildren, and five (5) great-grandchildren all appear in this photo (a sixth great-grandchild has since arrived). “It was hard to think about getting married back in 1936,” says Slim. “It was the depth of The Great Depression.” From this photo it looks like it all worked out! Harvey Ardis reports that all is well in the planning for the August 10th 2002 Reunion in Evart Mi. Put it on your calendar and mark it in red. Brigitte Bruggema, who is our on the scene reporter and works for the Downtown Development (as opposed to Uptown) reports that the Evart Review (the news paper) has finally bit the dust and is no longer. Almost 130 year! She states that Evart will be getting their first Motel-Super-8 and will be open perhaps in June. So you out of towners take note. Also many of you may visit Evart other than in August. Brigette tells us that there are enjoyable things to do throughout the summer just to name a few: The Pub Runners (Irish Rogues) June 14th 8-10 PM, June 22nd brings an all day Celtic Celebration from noon to 8 PM with Irish Music. And many more, which we will bring to you later. These are all outside and a lot of fun. Make a point to enjoy our Hometown. Thanks Brigette for your interest. Also from the same paper January 24, 1918. Reports of many deaths due to diphtheria and small pox and “a shot gun quarantine seems to be necessary in some places in order to secure respect”. A number of Ardis sons have distinguished themselves in education, but perhaps none more than Evart William “Slim” Ardis (1913-). Son of Samuel and Katherine Ardis in McBain, Slim struggled through Western Michigan University in Kalamazoo in the early years of the depression, finally graduating in 1935. He was hired to teach in Freeport, Michigan, one of only a handful in his class to actually secure a professional position during these hard Depression times. Slim was grateful, as this would allow him to marry his childhood sweetheart, Dorothy L. Schurman (1914-2001), of McBain… and begin to repay his sister, Katherine Ardis (later Ux) (1909? - 2000), for funding his education through her own income as a teacher. Slim was actually hired as principal at Freeport… at age 21. The second year they made him superintendent. He would go on to be superintendent of schools in Inkster, East Detroit (now Eastpointe), and Ypsilanti, Michigan. At age 47, he would have accumulated twenty-five (25) years as a school superintendent, and then go on to spend another twenty (20) years as Director of Career Planning and Placement at the University of Michigan (Ann Arbor). In his “second career” at the University Slim was not only responsible for helping graduates get their first jobs, but personally consulted with hundreds of Michigan local school boards engaged in finding a new superintendent of schools. Along the way, Slim would collect a Master’s Degree from Northwestern University (Evanston, IL), have an elementary school named after him in Ypsilanti, be granted two (2) honorary doctorates (Eastern Michigan University and Cleary College), serve as an officer of both state and national educational organizations, be cited by the Michigan State Legislature and numerous state and local groups for his contributions to Michigan education, be honored (along with his sister, Katherine Ardis Ux) by receiving the Distinguished Alumni Award at Western Michigan University (1975), and be inducted into the Michigan Education Hall of Fame. Now 88 and living in Irvine, California since 1982, Slim has many achievements in education to look back on. One of his proudest accomplishments is the lobbying work that he, and about a dozen other superintendents from around the country, did during World War II and in the immediate post-war period. They lobbied the Congress to have the Federal government take a role in public education. Slim found himself in 1942 as superintendent in Inkster, Michigan, a largely Black community that had been severely impacted by the War. Workers had flooded in from the Southern states to man the defense plants. The housing stock was extremely poor, the roads were unpaved, there were no schools, and worst of all… for Slim… there was no “tax base” to build any. The first thing that Slim did was to look for local resources. He organized the first athletic program the community had ever had… getting local merchants to donate team uniforms and even land for an athletic field. He met several times with Henry Ford (yes, “the” Henry Ford… Sr.) who had his Rouge Plant nearby, but outside of Slim’s taxing authority. Ford Motor Company wound up giving generously to the Inkster School District, but generally “in kind”… and not always the type of furniture or equipment that was really needed. Local charity was great, but Slim knew that it would not take care of a whole generation of poor, Black youth waiting for an education. It was in late 1942 that Slim got together at a national meeting with about a dozen other superintendents from around the country. They agreed to develop a plan whereby they would attempt to get the Federal government involved in public education. From 1943 until around 1954 this group had members constantly shuttling to Washington, DC. There they trod the halls of Congress, telling their stories, and searching for support. It was at this time that Slim would develop a personal relationship with a number of the Senators and representatives, most notably Sen. Frederick G. “Fritz” Lanham (D-TX) and Sen. Hubert H. Humphrey (D-MN). Lanham was quite influential on the budding “education issue.” He was known as a “Copperhead” Democrat, and would undoubtedly be a Republican in modern Texas politics. He is remembered today for his landmark Depression Era bills having to do with the establishment of commercial trademark protections and the regulation of investment companies. Humphrey, of course, would later be Vice President and still stands today as sort of a paragon in American “liberal” politics. Slim tells a number of amusing stories from his days of lobbying in Washington. Fritz Lanham one day decided to introduce Slim to his fellow Texan, Lyndon B. Johnson (D-TX). “Where you from, boy?” asked the tall Texan. When Slim replied that he was from Michigan, Johnson feigned a look of pity. Shaking his head he said, “That’s too bad, son.” Another time, Slim and a couple of other superintendents were in the office of Representative Gerald R. Ford (R-MI). [Slim is sure Jerry Ford would deny this story, even to this day.] Slim knew Ford from his days in Freeport. Ford reclined on his couch, leaned back closing his eyes, and covered his face with his crossed palms. Slim and the others made their pitch for Federal aid, for some twenty minutes, not knowing if they were making any impact… or even if the important Congressman was still awake! Finally, there was a pause. Ford bolted up erect, stood, and walked to the door of the office. It wasn’t the first time they had been “booted” from a Congressional office… they all knew what to do. As they lined up to file out, they expected to arrive in the hall with only a handshake. Instead Ford stood with his hand on the doorknob. “Fellas,” he said, “I could never vote for something like this. The folks back in Grand Rapids would think I had lost my mind. But, I understand your problem. There are some people here that owe me… and I’ll get 12 or 15 of them to vote for your deal.” And he did. Such is the world of Washington politics. It was in the period, between World War II and the early 1950s, while Slim was at Inkster and then later East Detroit (now Eastpointe), that his relationship with Hubert Humphrey became somewhat “personal.” The two men would fly together from Washington each Friday on the marvelous new Northwest Orient “Strato Cruiser” or the TWA “Super Constellation.” Slim would get off at Willow Run and Hubert would fly on to Minneapolis. Hubert would be back in the Capital on Monday and Slim would rejoin him the following Wednesday or Thursday. Slim enjoyed all the “war stories” of Congressional battles. Hubert seemed to enjoy having a patient listener from the “real world,” outside of Washington, to try his political ideas on. Never a partisan political activist, nonetheless Slim would always maintain a deep admiration for this man that had opened his heart to the young children that needed an education… and to the young superintendent that was struggling to provide it to them. Today, ninety-one percent (91%) of support for American education is still “local.” Slim thinks the Federal government, however, has a solid role as a “partner” with the states and local school boards. He points to direct aid to school districts, program support such as “Head Start,” and financial aid for college students as programs that have “made America strong.” Slim feels the Federal role has been particularly important in ensuring “equal access” to education. This in turn has been the key to “social mobility” and building a strong middle-class in post-war America… two (2) things Slim thinks have been key to promoting both social and financial stability in America. Slim is proud of his small part in helping bring this reality into the American consciousness. “That’s what we are ‘selling’ to the rest of the world,” says Slim. “They don’t educate their people the way we do, and give them good jobs. That’s why people in many Third World countries have to live in walled houses with barbed wire and private guards out front.” Slim’s words have an extra impact today, as we learn about the Islamic schools (“madrasas”) around the world that have been used for evil, rather than for good. We apparently have quite a “selling” job yet to do. Slim’s beloved Dorothy passed away in August of 2001, at age 86. Her ashes are interred at the Crystal Cathedral in Garden Grove, California. Dorothy had a “personal bond” with Dr. Robert Schuler. As a student minister from Hope College (Holland, MI), he had come to McBain (where Dorothy and Slim grew up), Marion (where Dorothy was born), and Moddersville (where she had taught in a one-room schoolhouse). Dorothy had grown up in the Reformed Church in America (RCA), and when she joined the Crystal Cathedral in 1982 it was somewhat a return to those childhood roots. If you should visit Garden Grove, Dorothy and Slim’s “niches” are immediately to the right of the sarcophagus reserved for Dr. Schuler and his wife. A number of Ardis Folks have been very generous in giving back to the communities that sustained them and which gave them their success. Slim is no exception. Before Dorothy died last year, they completed a series of major gifts for “educational purposes”… totaling some several hundred thousand dollars. The largest and most “public” was $100,000 to Central Michigan University (Mt. Pleasant)… to establish the Katherine Ardis Ux* Endowed Award in Art. This $5,000 annual prize will allow an outstanding graduating senior to travel, attend graduate school, buy art supplies, or do whatever they need to do in pursuit of their art. * Katherine was Slim’s beloved sister. [His other siblings included Burke (McBain), Bernard (Ionia), and Margaret (Alpena), all deceased.] Katherine developed her own unique perspective on art by studying in places as diverse as Scandinavia and with the Native Peoples throughout South America. Katherine died in 2000, at age 89. Wherever she is, Katherine must be smiling. If you are reading this newsletter you are undoubtedly the keeper of any number of interesting stories about Ardis Folk. Honor a parent, cousin, sibling or uncle by writing it down… and sending it to the Ardis Newsletter. What may seem like just an “ordinary life” to you could be very interesting to the rest of us. If you don’t write it down, probably no one else will either! Then it will be gone, eh? Is that any way to treat a family history? If you need help on this, just “scratch” it out as best you can… and send it in. Your esteemed editor will not let you embarrass yourself… by showing that you should have paid closer attention in that “creative writing” class you once took. From George Boyd – 96 yrs young!! …”I enjoy reading the Ardis News Letters…I remember many of the people mentioned…As you may not know, I spent 7 summers in Lake City as a Pharmacist in the Doudas Drug Store while I was teaching in Grosse Pointe. We also heard from Mark and Jackie Ardis in Charlotte NC stating that they have had quite a roller-coaster year in 2001 between funerals and weddings. Our prayers go with those that lost loved ones and we are looking forward to seeing them in Evart in August. I just talked with Harvey Ardis and he asked for our prayers for his brother, Howard, who has cancer. He is not doing well, so offer a prayer for him and his family. A sixth great-grandchild, Jamie Katherine Coyle , was born in October 2001.